Witch Roslindis Lehmann wishes her only battle lay with the famine threatening to destroy Saxonia. Instead, she must stand against Henkel and Gerlin, teenage siblings who have uncovered a means to stave off their hunger by turning to cannibalism. Caught while trying to determine their weakness, Roslindis only avoids their knives by pledging to build them a castle. She stalls, of course, still plotting to overtake them. The siblings, frustrated with her slow pace, enlist the help of Brunsten. 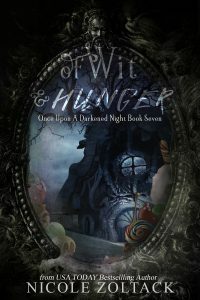 Of Wit and Hunger also includes the short story The Cost of Extravagance.